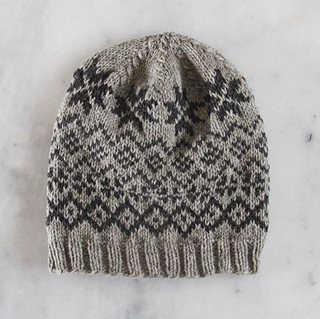 Faroeknit beanie is inspired by classic Faroese Fair Isle patterns. This beanie is slightly slouchy. 40 cm/16 inches long or 60 cm/24 inches long circular needles size 4,5 mm/US7 and 5 mm/US8, and 5 double pointed needles size 5 mm/US8 (or use two circular needles instead of the double pointed ones) Wool needle. Stitch marker (you can use a piece of contrast yarn as stitch marker).